Q. Who is Baby Sign Language suitable for? A. Babies aged between six months and 30 months benefit the most. Q. Will teaching Tinytalk be time consuming and hard to learn? Do I need any prior knowledge of sign language? A. Not at all! Tinytalk is a simple, concise and fun approach to learning an Australian version of Baby Sign Language. It has been designed to be easily picked up by people with no prior signing knowledge so they can build it into their everyday life as a natural part of communicating with their baby. Tinytalk uses easy-to-remember, simple signs that often resemble the object or activity they indicate. For example, the gesture for “EAT” is to place your fingertips to your lips. Such simple gestures make Tinytalk quick and easy for you and your baby to learn and use. Q. Will signing interfere with my baby's speech and language development? A. Quite the opposite! Research shows that Baby Sign Language encourages babies to talk sooner and helps to develop larger vocabularies. As soon as your baby can say a word clearly enough to be understood, they will generally stop using the related sign, as it is easier for them to talk than to sign. In fact, as words and signs are always used together, Baby Sign Language helps babies remember words until they develop the verbal skills to speak. Q. Why sign if my baby is going to talk soon anyway? A. Because until they can talk in sentences and verbalise their needs clearly, babies often express their frustration through tantrums, throwing things, or not eating or sleeping. Signing reduces the frustrations that lead baby to express negative behaviour as it gives them the opportunity to express themselves and communicate about things that interest them. Research has shown that signing helps babies talk sooner. Do you really want your baby to miss out on that opportunity? Q. What if my baby is already talking/saying some words. Is it too late? A. Definitely not! Even when babies start to talk, their vocabularies are very limited as it takes time for them to learn new words. In addition, some words like “SCARED”, “ELEPHANT” or “TOILET”- are more difficult than others to master. Introducing signs to babies for words they cannot say can help bridge the gap until they learn the words. As babies learn new spoken words, they can help you to understand the meaning of the words by using signs, eliminating a great deal of frustration for you both. Q. What about the "terrible two's"? Does signing help? A. Research has shown that signing reduces the temper tantrums associated with the frustration babies experience by not being able to communicate. Signing may not completely stop a tantrum when your baby doesn't get what they want (as any parent knows, few things can do that! ), but because you understand what your baby wants, you can try to avoid these situations or offer an alternative. Q. Is Baby Sign Language Universal? A. Sign Language is NOT a universal language; each country has its own version and usually within each country, including Australia, there are several ’dialects’. For instance, states within Australia differ with certain signs for certain words and if you have learnt to sign in Queensland you will have to learn some new signs to communicate with someone in Victoria. This makes it very difficult when producing a national system and therefore NO system in Australia is 100% compatible within each state with Australian Sign Language, AUSLAN. For this reason Tinytalk takes many common sign language signs but also uses universal natural gestures. Q. Is Tinytalk based on Traditional Sign Language? A. 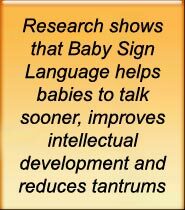 Baby sign is a temporary communication system used with 6  30 month old babies as a form of communication before they can talk. As such, it is not designed as a replacement for traditional sign language. Baby sign is designed for hearing babies and as those babies begin talking, the signs are dropped as speech takes over. Baby signing is very different from adult signing. With babies it is very important to use easy signs and keep signing fun, so it is not as important which hand is used or how precise you and your baby are as long as you understand each other. With traditional sign language it is important to master the signs and grammar correctly as it is a language used to communicate within a whole community and you are not always speaking to familiar people. Babies do not have the motor skills to perfect a lot of the traditional sign language signs, therefore signing with babies needs to be kept simple. As hearing babies drop signs as they start to talk, there is obviously no point pushing them to use a sign that they will never master because by the time they are physically able to, they are no longer using it. Therefore the signs and techniques Tinytalk use are a lot simpler. Tinytalk signs are based on what babies can physically do. Using 100% traditional sign language signs would be too difficult for a baby to manage. Q. What about using Baby Signs in Childcare Centres? A. Tinytalk is ideally suited to any early childhood development program. It is a practical tool that enables babies and toddlers to express their needs and wants to carers, and its use in an early childhood setting can have an incredibly calming affect on group behaviour. Babies who can express their needs are understandably less frustrated, and less frustration means fewer tears and tantrums! We have been trailing Tinytalk-baby sign language here at Hutchison's Early Learning Centre Keebra Park for the past 3 months in our Nursery room and have just begun trailing Tinytalk in our Toddler room. We have found the babies to be responding positively to the program. They are communicating to our carers when they are hungry, tired, thirsty, sick and many other needs, reducing frustration and tears and assisting carers to understand the children’s wants and feelings. The carers find the signs easy to incorporate into the everyday routine and have found that there are amazing benefits to using Tinytalk. Parents and guardians at our centre have also given positive feedback and are very keen to begin Tinytalk at home.